INDONESIAN poet Khairani Barokka, known as “Okka”, appears today in a reading session at the School of Music’s Biginelli Espresso. 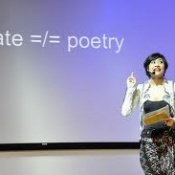 An Indonesian writer, performer, artist and researcher who was, last year, was the first Indonesian writer in residence at Vermont Studio Center in the US, she is an advocate of spoken word poetry and creative performance in Indonesia and wants to make the arts more inclusive to Asian people of all abilities. The Indonesian visitors will be accompanied by readigns from local poets Hal Judge, J. C. Inman, Sandra Renew and Hazel Hall, all of whom will be well aware that the art of performance poetry in Indonesia has long been well in advance of that in Australia. Khairani Barokka and Butet Manurung, at ANU School of Music’s Biginelli Espresso, 12.30 pm today, Tuesday, November 6.